with a beautiful copper patina applied to the solder. A silver jump ring has been added. 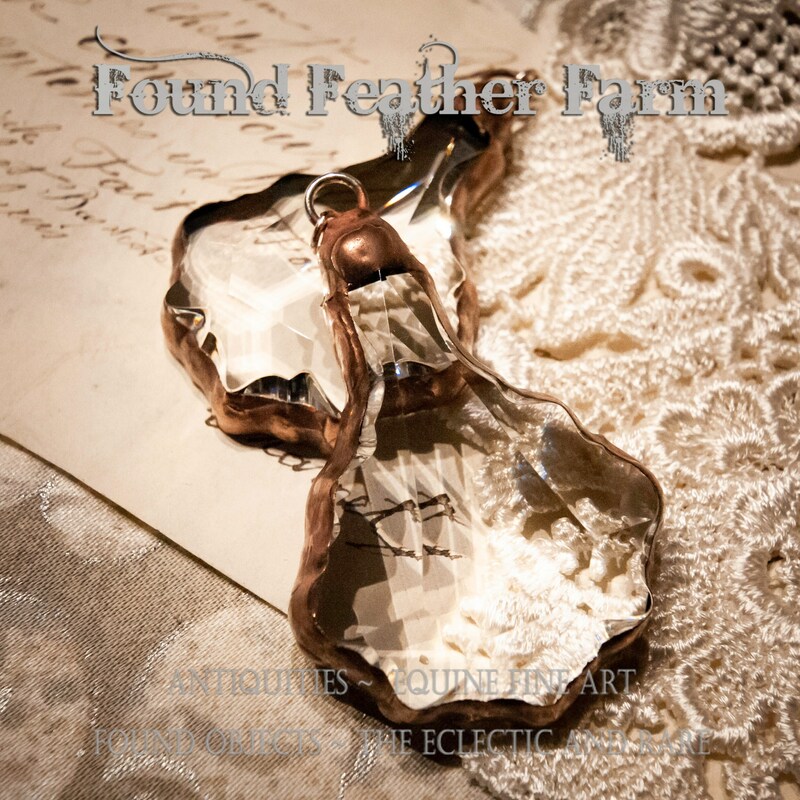 Size: Length 2.75" x Width 1.85" x Depth .50"
Found Feather Farm accepts PayPal, Etsy Gift Cards & Credit Cards. SALES TAX: NC residents - 6.75% Sales Tax will be added to your orders as required by law. Please be sure to enter your correct shipping address for purchases. In the event that Etsy and USPS show two different addresses, your package will be shipped to the Etsy address unless an error is determined by the USPS. All items will ship within 1-3 business days after payment is confirmed through Etsy unless otherwise noted. Many items may ship the next day. We try our best to deliver great service and maintain our shop in a very professional manner. Please Note: Shipping Charges also include handling & packing materials used and often package insurance. Some shipping charges also include a signature conformation required. Items ship USPS, UPS or FedEx. We can offer special overnight shipping if requested however this will incur additional charges at the expense of the Buyer which may be billed through PayPal. All purchases are shipped with Tracking. Some purchases will be shipped with Insurance and Signature Confirmation. DUE TO THE RARE AND VINTAGE NATURE OF THE ITEMS ON THIS SITE, ALL SALES ARE CONSIDERED FINAL. If an item comes back to us marked as unclaimed for any reason, we are not responsible for any shipping fees. The item will be relisted without refund unless the buyer contacts us, asking for the item to be reshipped a second time at their own expense. Due to the vintage nature of items on this site, all sales are final. Due to the vintage or original one of a kind nature of items on this site, all sales are final. The shipper will be responsible for any damages that occur in shipping. We will take very careful extra steps to insure that all items are packaged extremely well and handled with the utmost care and insured where neccessary. We commit to give a complete and accurate description of each vintage item including any flaws as well as the positive attributes with good photography to illustrate each item correctly. We are very proud of the positive feed-back that we have received. All sales are considered final. 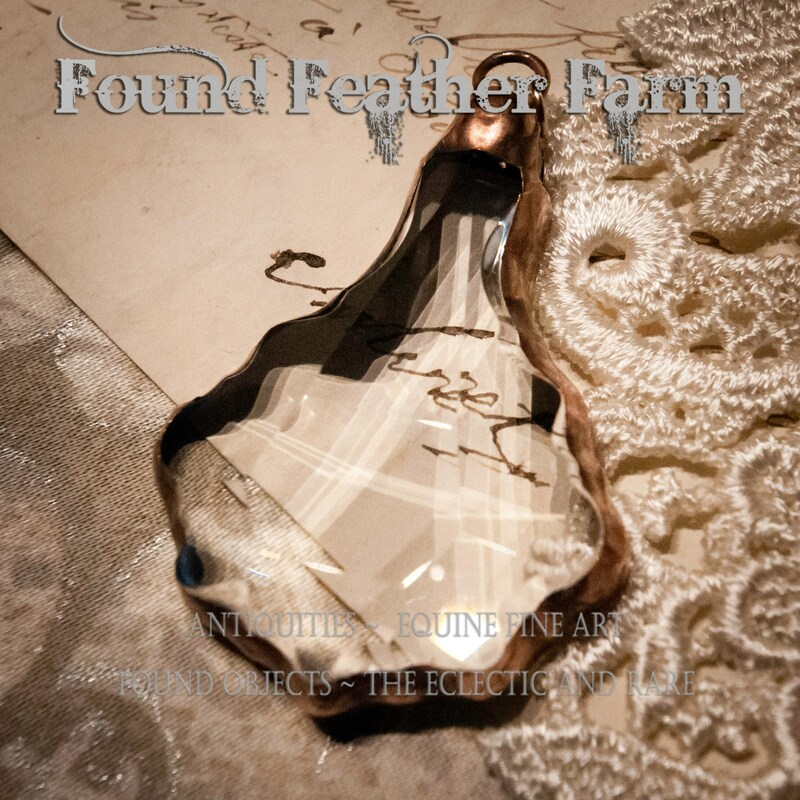 Found Feather Farm is not responsible for loss, damage or theft en route for any uninsured purchases. BUYERS PLEASE BE AWARE THAT THERE WILL BE NO REFUNDS ISSUED FOR THE SHIPPING OF UN-DELIVERABLE MAIL OR DELIVERIES THAT ARE RETURNED. I can reserve an item for a short time frame if you are interested in something but are not quite ready to place an order. A reserve will post the buyers name and be held for a maximum of 10 days. Message me if you need to reserve an item. This is BeeeUtiful! I thank you, Terry, for the perfect chain you chose to connect to this beauty. 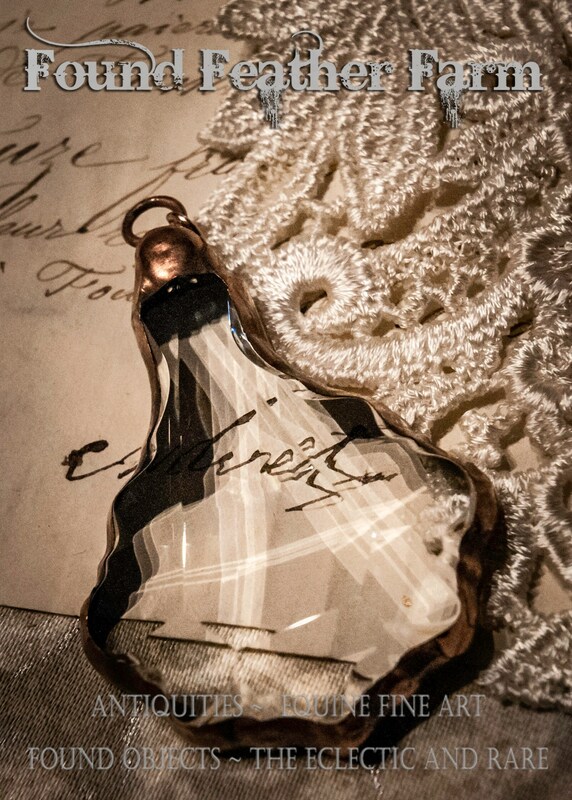 The chain is beautiful in itself, and hangs on a thick glassed vintage wine bottle. Your items really set off the bottle and the light catches within the crystal. I am so grateful for your lovely pieces!